We live in an age where our data is constantly being programmed into various sites for purchases, social media, blogs, and so on. This personal – and sensitive – information is stored “safely” in sites and servers with the assumption that each is secure – but in reality, there are many out there who have access to it. According to the Bureau of Justice in 2014 about 7% of persons age 16 or older were victims of identity theft. At the time, the population was approximately 318.9 million, meaning that roughly 22.323 million were suffered from identity theft. While not as common as other crimes, it’s still pretty prevalent and it can (and has) wreak havoc in anyone’s life. Identity theft can be a huge inconvenience, and even temporarily ruin the life of the affected due to a lack of cash, credit, and government information. Fortunately, there are several ways to help fight the theft should it occur, but the best protection is prevention. This guide was designed to help others avoid identity theft: what to look for, how to prevent it, and what to do if it happens to you. Identity theft is fairly straightforward and self-explanatory: it occurs when one’s private and personal information, like their name, social security number and credit card numbers, are stolen and used by someone else. The Federal Bureau of Justice defines it as, “The unauthorized use or attempted use of existing accounts, or the unauthorized use or attempted use of personal information, to open a new account or for other fraudulent purposes.” It can very quickly and easily destroy one’s credit score, which affects opportunities for healthcare, insurance, and obtaining utilities like gas and electric. Identity theft is a serious crime but often goes unpunished as it can be very difficult to pinpoint the location and identity of the person using the alternate, stolen identity. Because regaining a stolen identity is extremely tedious, the best defense is a good offense. There are several different types of identity theft including Medical, Child, Social, Senior, and Tax​. The first and most important step to avoid identity theft is making sure your sensitive information is protected. This includes monitoring all personal accounts, even (and especially) social media. Knowing exactly what information is posted publicly can make or break your data safety. Checking your bank accounts regularly, even daily, is the absolute best way to catch identity theft before it becomes consuming. Choose tricky passwords. Don’t choose easily guessable information like the name of a pet or your mother’s maiden name, i.e., stuff accessible on a Facebook profile. Be careful about revealing your location. Posting photos will often pinpoint you to a certain location. If you don’t want this know, be mindful of whether the app has access to your GPS. Monitoring your credit score will make any abnormalities obvious, which can then be reported to authorities and properly disputed as fraudulent. Each of these three major credit agencies will provide one free credit report annually, and – if staggered – offers a look into possible credit disruptions every four months. What’s more, banks now offer complimentary credit reports depending on the terms of the account(s) you hold with them. Thoroughly reviewing personal documents (credit reports and tax files) and keeping them in a secure place like a safe or locking filing cabinet ensures that you understand exactly what each document contains while also preventing them from possible theft or manipulation. This makes it extremely difficult for identity thieves to forge or change paperwork. This key point is commonly ignored or forgotten, which only reinforces why it is so important to adhere to. Carrying personal information like a social security card is dangerous for identity theft. If a wallet with something like a social security card is stolen – stealing an identity becomes extremely easy. It’s also important to be aware of “shoulder surfers” – those who hover while you’re using an ATM or relay eavesdropped credit card information when you’re on a phone call. Emails that are automatically sent to spam may contain seemingly- legitimate offers or services, and might even appear to be from your bank. However, legit banks and businesses know that it’s of absolute importance that credit card information is never sent out or requested via email. Many online shops steal information via email so be sure to research the validity before entering sensitive information. ​One of the most obvious warnings is money disappearing from an account without explanation. Unfortunately, the explanation is almost always identity theft. Another warning sign is never receiving bills. Identity thieves will often change the address on bank accounts and the like so that bills aren’t received by their rightful owner. This makes it possible for the thief to continue stealing for a longer period of time. Stores not accepting your checks. This is a telltale sign of suspicious activity in your bank account and may point to identity theft. Receiving notice of a data breach with a bank or online service that you use. Hackers target large databases of information and regularly invade the data servers of major corporations in order to access and exploit the personal information of users. Calls from debt collectors informing you of suspicious charges that weren’t made by you. Insurance or healthcare refusing to provide treatment due to the balance, or because of a medical condition not previously documented is usually a telltale sign of someone using stolen insurance coverage. In some cases, the IRS may send a notification that multiple tax returns have been filed under a single name. This means that an identity thief has gathered enough information to create an entirely different life from you, and this can be very difficult to resolve. After all possible steps have been taken to regain identity, there’s little else to do but wait and fill out the remaining paperwork necessary for confirming the true identity. Regrettably, identity thieves are not always caught, and while both credit and identity may be restored to an individual through the federal process, the criminal will often move on to their next victim. Returning to life per usual after identity theft can be difficult, as federal disputes and actually charging the criminal can be a tedious and extraordinarily time-consuming process. While identity theft can be stopped before it starts via careful monitoring and proper precaution, there are millions of cases every year of severe identity theft, and the hardship it causes those affected. Because the impact of identity theft can be so significant, it’s important that all measures are taken to protect an identity before it is stolen. According to the Insurance Information Institute: $16 billion was stolen from 15.4 million U.S. consumers in 2016, compared with $15.3 billion and 13.1 million victims a year earlier. 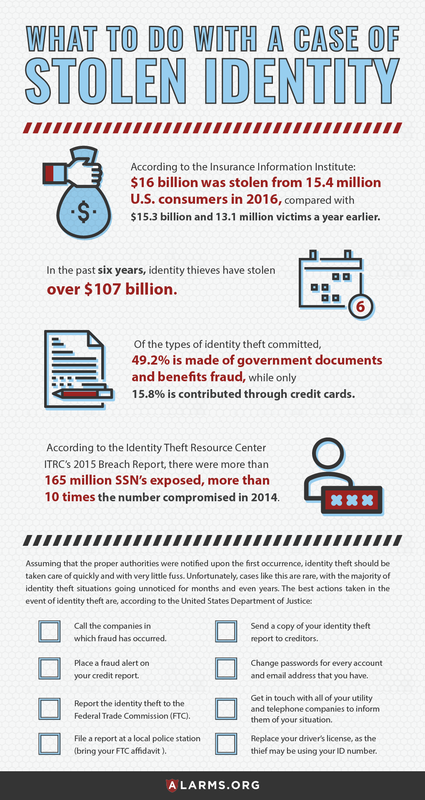 In the past six years, identity thieves have stolen over $107 billion. As of July 25th, there have been 858 breaches in 2017, according to the Identity Theft Resource Center, exposing 16.4 million records. This rise is astounding, but should only be intimidating to those that do not have secure backup plans and understand the process of identity theft. The absolute best way to stay protected, even through SSN using leading to identity theft, is to maintain knowledge of how to react and what actions are best for each specific identity theft situation.